It’s an act that has selflessly delivered us dance hits for no less than 25+ years. The Chemical Brothers show both rolls on and shows no signs of resistance with the UK duo putting out another cracking album today for our lucky ears. ‘No Geography’ is their first body of work since 2015’s chart pumping album ‘Born in the Echoes’ that most famously included the tensely paced dance single ‘Go’. The new album continues where they left off, flying out of the barriers with the intentionally nightmare inducing ‘MAH’ and ‘We’ve Got To Try’ that blends that signature strings x acid synth sound that’s so uniquely defined them over the years. The new album takes you through a journey of different emotional tones with a mixture of acoustic and synthesised sounds creating suspense, intensity and cool abrasiveness. There’s an overall feeling of nostalgia with every song giving the ears that warm familiar noise hug of The Chemical Brothers you know, but at the same time delivering something you can’t help but envision as being exciting to see at their live show. Let’s face it, if you can sit at work and listen to them without having a dancing fit, then we’re in pure admiration! Can we just also take a moment to appreciate the cover art as well. Not only has it got a political undertone, but you can also just feel everything that it has that represents what The Chemical Brother are about. I’d place it loud and proud at the front of my vinyl collection. 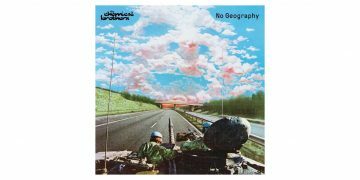 The Chemical Brothers album ‘No Geography’ is out now on UMusic Australia.